CNN mentioned that since it was being renovated they had removed a lot of the statues. They just said inside the cathedral they used 52 acres of timber to build it. No wonder its still burning. It looks like the big windows may still be in place on the sides, but with the roof collapse you have think that the interior is a loss. Cnn is saying that the fire chief is saying that they're trying to "keep the tower from falling over the next 90 minutes". Not sure what tower they're talking about. My guess would be a roofing torch. This is heartbreaking to watch. I was fortunate to tour the cathedral about 9 years ago. Truly beautiful. Full of priceless art and religious relics including pieces of the cross at Christ's crucifixion and part of his crown of thorns. My recommendation on "relics" is to read up on them before believing any one of their stories. Like, they were the magic elixir of the alchemists or the tonic of US 19th Century Medicine Shows. Like literally every cathedral was buying relics to compete for pilgrimages. I'm way more concerned about the art than a piece of wood some road jester in 1500 was peddling for a huge profit. Most often, the term "relics" refers to pieces of bone that are the remains of saints. The middle finger of St. Lebowski is considered to be one of the most highly prized. 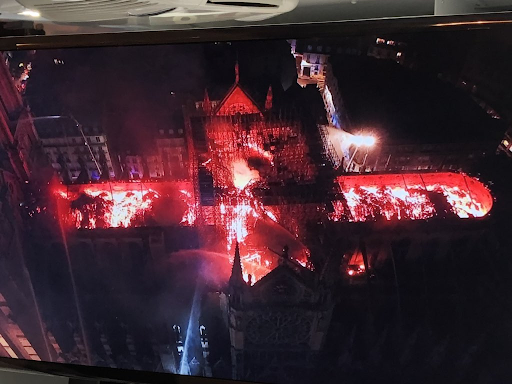 Reports are that the north front tower is the one that is in danger of collapse and it sounds like they still don't have the fire under control. The most senior firefighter in Paris says it is unclear whether they will be able to keep it from spreading and causing more destruction. My understanding as you enter the front of structure there is an entryway 3 spires with huge bells the largest in middle being 9 tons. If it falls they think it could pull the rest down. Was scolded for pulling out my camera and taking this picture, felt embarrassed at the time. Glad I did now. It looks like there's a big fire in the wing with the Rose Window now. Edit: the South Rose Window. Evidently, there are three of them and the North one is the most famous. I don't see flames in that area. I was able to get some decent shots of the place when I was there. What a sad situation.